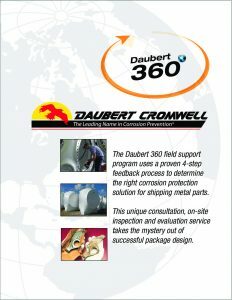 Daubert 360°™ Field Inspection Program is a complimentary program to help our customers conduct and evaluate packaging design trials for corrosion protection. It’s truly a team effort. 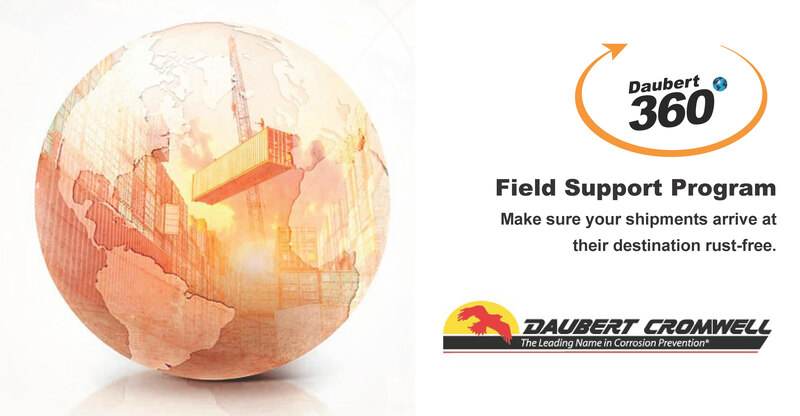 With Daubert 360°, our global team works with you to design, execute, inspect and assure complete corrosion preventive solutions. The program includes study & design of all relevant processes, products, and protective packaging methods in field situations, monitoring, and inspection of shipments upon arrival. Your parts should arrive at their destination rust-free, whether you ship them across the country, or across the world. Contact us for all the details of this exclusive, comprehensive service. Daubert Cromwell specializes in volatile corrosion inhibitor (VCI) protection for metals. Providing quality corrosion preventive products and services to meet the evolving needs of global customers. We can help you choose the right VCI to solve it. Just explain your situation in the form below.